A behind-the-scenes look at the visual effects in Playtime Season 4. CruelLEGACEY demonstrates the creation of Playtime Season 4’s weather and lighting effects; transforming the locations of Halo Reach and Halo 4. Witness the creation of snowfall, thunderstorm, day/night cycles, and other powerful visual effects. Playtime Season 4 premiers spring 2013. For other related posts, click here. 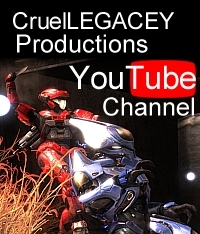 Video | This entry was posted in Halo 4, halo reach, Playtime, Playtime News, Video and tagged playtime, season 4, vidoc. Bookmark the permalink.